Synopsis: When her father dies in battle, fourteen-year-old Thirrin becomes Queen of the Icemark, determined to defend her tiny kingdom from the most terrible invasion her nation has ever known. This is the epic story of how she rallies her country and finds some extraordinary new allies: Vampires, Wolf-folk, giant Snow Leopards - and most precious of all, her friend Oskan, Witch's Son. Times are changing in the world of the Icemark, and slowly the behemoth of the world, the Polypontian Empire, is focussing its gaze on the small but tough Icemark, seeking to expand it’s already gigantic empire. The Icemark needs allies, but what can it do when there have been hostilities with all the neighbouring lands? It’s up to Queen Thirrin, a 14 year old girl to try and make amends. But it won’t be easy, particularly at the hordes of armies that the Polypontus has under command…. Stuart Hill has managed to pen a fantastic debut novel, encompassing everything that is great about fantasy into one action packed book that is sure to warm the hearts of many people. Although The Cry of The Icemark is quite obviously a representation of the Romans and the Celts, and Rome’s conquest for Britain, The Cry of The Icemark puts a great fantasy spin on it and tells the story from the angle of the defenders- the Icemark. There’s no doubt that Stuart Hill has drawn his ideas from the Roman campaign (probably on purpose), but this makes the book all the more enjoyable, and I found these parrallels amusing and a great idea: it works so well with the setting. Stuart Hill’s world building is phenomenal, too: he has created a rich and wonderful fantasy reality, combining well known elements such as werewolves and vampires with thr original ideas and concepts of the Snow Leopards and the Holly and Oak people. Even overused fantasy elements that feature in The Cry if The Icemark have a great spin on them, and it makes you wonder why noone else has come up with simar ideas. Many of the races and places are highly detailed, and I can only wonder how long it took Stuart Hill to invent them, they are so delightfully intricate. Again, Stuart Hill scores top marks for his characters. They all seem to have individual personalities, and they seem so real: none of them are the same, and the interactions between them are sometimes extremely hilarious, it’s very hard not to love them! Thirrin and Oskan are very endearing, and you almost feel sad that the book draws to a close. Luckily, there’s another book! I found the battle scenes to be very well described and thought out. Unlike many battle scenes from books, Stuart Hill describes many details, making it very easy to visualise. If you think you get bogged down by all the descriptions, don’t worry, as there seems to be a very good balance, and I’m sure you won’t feel that the battles are too detailed or descriptive. Stuart Hill’s prose throughout the book is also very good: there is never a moment where you think ‘xyz could be improved’ or that ‘abc is a little too fast’, although is does rely quite heavily on description. This is not too much of a problem though, and I soon adjusted and got used to it.. For a debut novel, that is a fantastic achievment, and I can’t think why Stuart Hill didn’t start writing earlier! In a few sentences, The Cry of The Icemark is a spectacular and endearing debut novel that is sure to find a spot on everyones bookcase. This book is sure to have you hooked right from the start, and I haven’t met anyone who hasn’t fallen in love with this fantasy world after reading it! What did you think about The Cry of the Icemark? 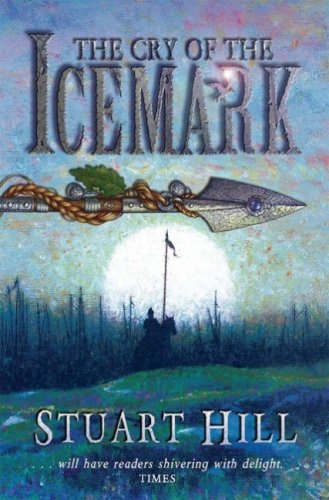 Stuart, I loved Cry of the Icemark, but I’m an audiobook sort of guy. Why haven’t I seen the sequels in audio format? Seems to me like there’s plenty of demand. I would hazard a guess to say that they weren’t successful enough as audiobook so the publisher decided to drop them. Pity really.